Book of the Day > Keiichi Tanaami: Early Pop Collages, Fragrance of Kogiku. Published by Walther Konig. "This collection of collages by Tokyo pop artist Keiichi Tanaami (born 1936) presents a thrilling 1960s barrage of weaponry, superheroes and movie stars. Tanaami was on the edges of Tokyo's postwar avant-garde, and a 1968 encounter with Andy Warhol spurred him to explore mediums ranging from posters and album covers to prints and animations. The variety, skill and number of these works surprise all the more since collage has not been widely known as Tanaami's favored medium—and indeed these collages, undated but believed to have been made in the late '60s and early '70s, were never intended to be exhibited (unlike Tanaami's better-known illustrations and animations). 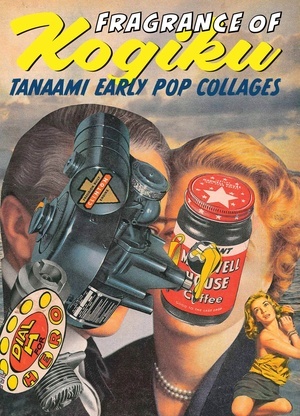 Text by Tanaami accompanies the more than 200 collages in this bewildering collection."